Alberta’s rural schools are getting together for a Canadian first: to talk about Gay-Straight Alliances and diversity. Alberta's rural schools are getting together for a Canadian first: to talk about gay-straight alliances and diversity. More than 200 people invited from schools across the province piled into the gymnatorium in Strathmore. 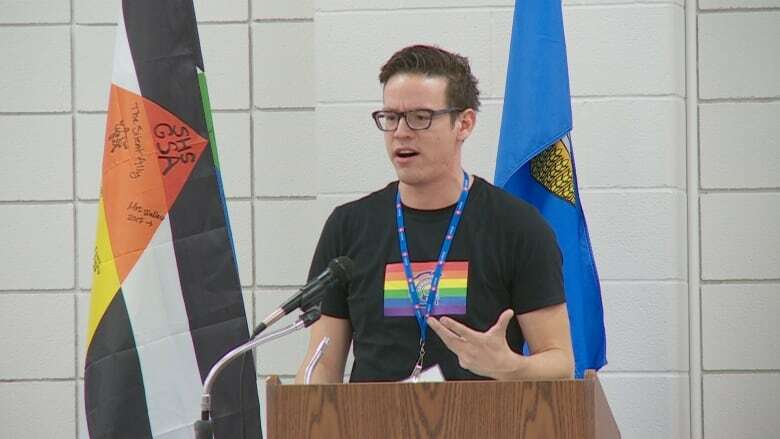 The Gay-Straight Alliance Summit was set up to explain to students, teachers, administrators and counsellors what role GSAs have in schools — in a rural setting. Out of 60 schools invited, representatives of 15 made it to Strathmore High School to attend the summit on Thursday. "What we have the privilege of in larger cities is the visibility around diversity and comfort around having those types of discussions," said Gregory John, director of the Strathmore GSA Diversity Summit. "Bringing these conversations to a rural setting is transformative." John attended Strathmore High School, where the event was hosted, and told students this week was one of the first times he visited and felt confident. As a student, he felt he had no one to talk to, he felt alone, and that feeling followed him into his adult life. When he began to speak publicly about his experience with his sexuality and sexual abuse, he realized opening up was key in his healing process. Kyle Larson, principal at Strathmore High School, said they have been an accepting school for a while, and the summit was an opportunity to share what they practise with rural communities that might not have an example to follow. The event had a larger turnout than Larson and the organizers expected, which he takes as a sign that GSAs are a big issue. "The opportunity for schools to be involved in something like this is becoming a greater factor every day," he said. Grade 10 student Meadow Tribe said the event was inspiring — she's glad she lives in a generation in which people are more accepting. Carissima Rapai, a Grade 8 student from Strathcona-Tweedsmuir School, said kids need to feel accepted. "For all of the students who are actually in a part of the community and just don't know it yet, or are too afraid to come out to their parents or their friends, they really need to feel like they belong," she said. "We heard today that they are at higher risk for suicide."